A scarecrow in a corn field certainly seems scary ... if you're a crow, that is ... a crow that doesn't know any better. Through the eyes of a bird like that, it looks like a man standing there ... a scary man ... something to be shunned ... avoided ... for the sake of survival. It has one function ... to sabotage the crow's plans to do its work ... in this case, to find yet another creative way to locate, dig into, and eat the farmer's corn. 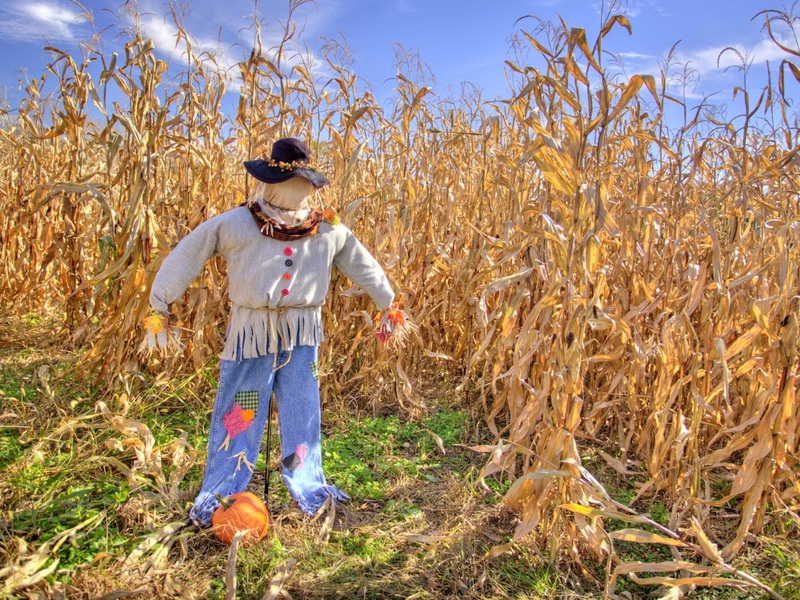 The scarecrow works just like the lizard brain to sow doubt in our minds, to scare us away, even to terrifying us, of taking our creative impulses with composing or improvising to the next level. In the case of composition, after you've already written a few stand alone pieces, it's your first prelude and fugue for organ that beckons you, or maybe your first toccata and fugue ... or, if you're an improvisor, improvising that first large work. And the thought of it has you immersed in a sea of doubt and plain scared to death. The fact remains, doubt has killed more dreams than failure ever will. The lizard would like you to curl up in a corner, take no risks, avoid all threats, and just hide from your own creativity. The paradox is, the more we hide, the riskier it is. The less commotion we cause and the less change we produce, the more likely we are to fail and be ignored. It's indicative of 3 things actually: 1) that there's love there, or there wouldn't be any fear, 2) the lizard brain, a real part of your limbic system living at the top of your spine, the place where Resistance lives, is the reason for your fear, and it's working overtime to get you to shut up, sit down, compromise, and just play it safe; it's the thing that tries to stamp out any insight or art; it's what's making you afraid of what will happen if your ideas get out and your gifts are received, and 3) the more fear the lizard makes you feel about going down a certain path, the more certain you can be that this path is exactly the one you need to be following to have a positive outcome [See blog, The Book, Parts I-II, The Lizard Brain, Parts I-VIII]. If the thought of writing a large work for organ is terrifying to you, then you can bet it's because the lizard is yelling at you to run and hide, that writing it is important to the growth of your soul, and that therefore you need to begin planning and writing it, in little bits at a time, starting today. You need to be brave with this and steer a course directly into whatever that larger or more challenging project is, that's scaring you. If you don't, the lizard brain with its insidious plot to inject you with fear, will succeed in stalling you, wasting you, and keeping you from doing some of your real work ... those activities which are part, if not all, of the reason you were put on this earth. You'll rationalize ... you'll procrastinate ... you'll compromise and keep your distance ... all based on what sounds like good arguments ... and you'll come away with a restlessness that nothing else can seem to satisfy. And the lizard brain at the top of your spinal cord, the place where Resistance lives, with its primitive biological advantage, will override and win over the higher centers of your brain where creativity is processed ... and it will win each and every time. It will also win if you pick out something artistic to do that's beneath you; trivial art isn't worth the trouble it takes to produce it. But when the lizard tells you not to attend something, go. When it tells you not to listen to something, read something, or do something, do it. When you feel the stall, the fear, the pull, the numbing paralysis, you know you're on to something. Whichever way the wind of the lizard is coming from, that's the way to head ... directly into it. And the closer you get to achieving the breakthrough you have in mind, the stronger that wind will blow against you and the harder it will fight to stop you. The only solution is to tolerate no rational or irrational reason to hold back on, follow through with, finish, and "ship" your art (exercise the discipline to get your artistic work before the public). The only solution is to start today, and to start now. For those who have experienced this and fought back, the feeling of liberation and new potential they feel is incredible.